I’m back in Illinois with Tammy now, but one thing I found out about my most recent time in Mississippi is that I’m not too old to learn new things. But during my last couple of visits it appears a few other words should be added to the mix. I can’t remember where I first heard the word but I have noticed it a lot more recently. There’s been a whole bunch of heppin’ going on while I’ve been down here. The other word I’ve picked up on was how people say the word pool. It’s being said as “pooh,” as in Winnie the Pooh. I knew I didn’t pay attention very much in English, but I must have slept through the whole silent “l” days. Fortunately Parker’s “Rage Quit” wasn’t this bad. But the new terminology wasn’t just limited to “Southern” words. My three nephews, also known as The Boys, sounded like they were speaking a different language. I was watching the youngest two, Parker (12) and Junior (8), play a video game one afternoon at my sister’s house when Junior started yelling at Parker. Junior: Rage quit! 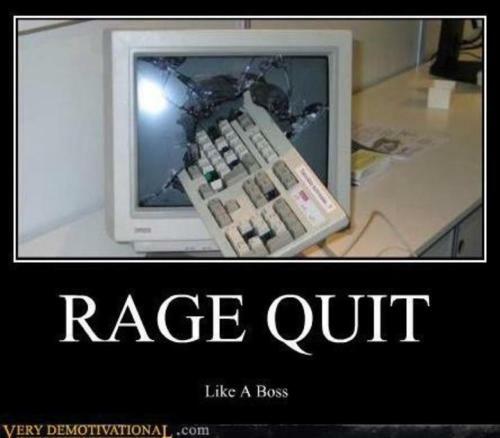 Rage quit!! Junior: He’s rage quitting because he got killed. Peyton: He’s screen cheating so he can find where Reed (Junior’s “real” name) is at. 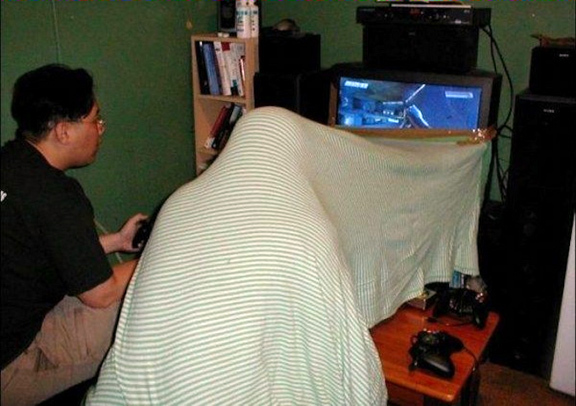 One way to prevent screen cheating. Then one night Peyton threw out another non-video game word that I didn’t know either. His Mom, my sister who I call Goob, came into the kitchen and we could tell she was pissed off about something. Peyton: Why you mean muggin? Peyton: Mean muggin’. You know looking all angry. I believe I’m officially old AND need my ears checked. My Mom’s long lost relative. My Mom has a pool, or as she’d say “pooh,” and one thing she doesn’t allow in it is sunscreen. Mom: You can put it on if you are laying around the pooh but you have to wipe it off before getting in. Me: Mom, that kinda defeats the purpose doesn’t it? Mom: Well, that’s what you have to do. 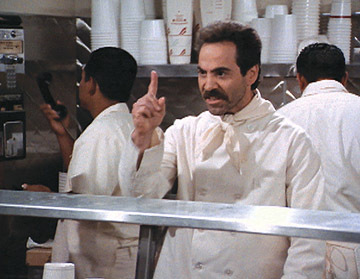 I got sunburned twice and apparently my Mom and Seinfeld’s Soup Nazi are distant relatives. Tammy flew down on the 22nd to visit with my stepdad and to see me. We got in late Friday night and by Saturday morning my Mom had already put us to work. She told us there were some bushes by the pool that she wanted removed, not just trimmed, because she was worried the roots would affect the concrete. We were attacking the main root that had started burying itself under the concrete when Tammy mentioned that her nose was running. 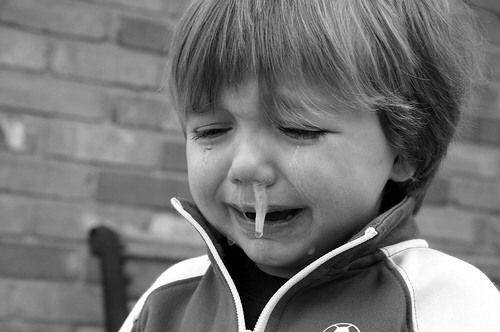 Me: You’ve been stirring up a bunch of stuff, so it’s prolly just allergies. Tammy: No… It’s so hot I think my insides are melting and it’s coming out my nose. 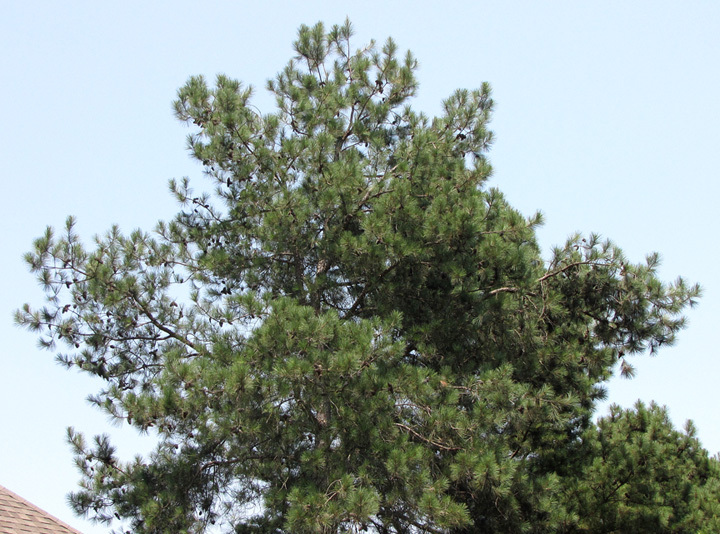 Birds or pine cones? You decide. Saturday afternoon while Tammy and I were sitting in the pool at my Mom’s, I saw her looking up at the trees that surrounded the back yard. Me: What do you keep looking at? Tammy: I kept looking up in those trees because I was wondering what those things were. Tammy: Yeah, I know that now, but I kept thinking they were birds. I was wondering why they all were just sitting there like that. Maybe it was her brain melting through her nose. It’s Not the Heat, It’s the Zzzzzz…. Tammy and I got into bed around 9:30 on Saturday night and were trying to find something to watch on TV. Tammy was wrapped up in the blankets so I curled up behind her and wrapped my arm around her. Tammy: I don’t know why I’m so sleepy. Less that 30 seconds later I felt her twitch. You know, the twitch that happens the split-second after you fall asleep. She twitched enough to wake herself up. Me: Seriously? You fell asleep THAT fast? Tammy: I guess. I didn’t even know I did. That wasn’t the only time Tammy fell asleep at the drop of a hat. We were on our way to the Memphis airport on Monday so Tammy could catch her flight back to Chicagoland when I couldn’t believe how cheap the gas was at one station. Me: That gas over there is only $2.94!! At first I thought she said it funny because she couldn’t believe how low the price was, but quickly realized that wasn’t the reason. It was because I had woken her up. Me: You were sleeping weren’t you? Tammy: I don’t know what’s wrong me. All I know is that I can’t live in a state that makes me sleep this much. One day I was trying to get gas at Kroger. I got out, opened my cap and but got frustrated when I realized I needed a special card to actually get gas. I angrily jumped back in the car, told Tammy about it and pulled out into the line of cars waiting at a red light. Then I heard someone honking at me. I started yelling at the car behind me, even directly looking in the driver side mirror shaking my head and pointing while I mouthed off. I sat there fuming, waiting for the light to change. When it did I made a right turn and as I did I looked in the passenger side mirror. Me: Oh man, I feel bad. Me: I thought those people were yelling at me for pulling out in front of them, but I think it was because I left my gas cap open. Tammy: You big dummy. You were yelling at them and all they were trying to do was hep you. I just slumped down in my seat. We didn’t make it half a mile down the road when car pulled up beside us, honked and pointed back to where my gas cap was flapping against the car. I waved politely to thank them for their hep. Don’t trust ANY of the clocks in Mom’s house, ain’t none of them right. The ones in the kitchen were about 13 minutes off. The one in the living room was 10 minutes off. The one in my bedroom was off 18 minutes. Mom told me to fix them, but I didn’t want to mess up the “system” she obviously had going on. I go through deodorant like a hot knife through butter. Tupelo has really nice garbage men. Not only do they come twice a week, compared to once a week here, but they also put the lid back on the can after it’s empty AND don’t put it in the middle of the driveway. My Mom puts her forks prong-side up in the dishwasher. The only other person I knew who did that was Sayid from Lost. During the three-week visit, I realized my Mom’s an angel. Not that I thought otherwise, but I seeing how much she does for my stepdad, who is still battling stomach cancer, made me see just how great of a woman she really is. She’s been so strong, patient and loving during this struggling and trying time. She’s been by James’ side during his month-long stay in the hospital and while he has been at home. When James finally does pass, which I fear could be any day now, I know he will do so with his loving wife by his side and will go from having one angel helping him to thousands welcoming him. Hang in there James and stay strong Mom. Gallery | This entry was posted in Daily Life and tagged daily life, family, humor, life, mississippi, Tammy, Travel. Bookmark the permalink. I have to say that I learned quite a few new things from this post – none of which I will probably remember. But the most interesting one is that you should not wear sunscreen in the pool. Wow! I put some of the forks up and some down in my dishwasher. Same with spoons. If they nest, they don’t get clean, right? LOVE Tammy’s perspective about it being so hot her insides are melting and coming out her nose! Laughed for an hour. The next time I decide to drive to Florida, I will now be able to speak the language of the South and understand it. Thanks! I think the only universal phrase that is understood globally is FU/the finger. Sorry for the tough time your family is going through. It is good you all have each other to lean on during this time.